The South African animal feed industry comprises two disparate groups - the formal and informal feed sectors. The formal manufacturing sector is represented by the animal feed manufacturers association (AFMA), and represents an estimated 60 percent of the country's total feed production. The remaining 40 percent of the production are represented by the informal sector (Briedenhann, 2001). In 2000, the industry generated 7.6 million tonnes of feed. Of this figure, 4.5 and 3.1 million tonnes were produced by the formal and informal sectors, respectively (Table 1). 1. Includes feeds derived from concentrates. The poultry industry (broiler and layer industry) is currently the largest animal feed user in South Africa. In 2000, it accounted for 40 percent of the national feed production. Production was dominated by the formal sector, which manufactured 2.9 million tonnes or 95.2 percent of the country's poultry feed. An estimated 533 million broilers requiring 1.8 million tonnes of feed are slaughtered per annum. Broiler breeders and layers account for an additional 1.2 million tonnes of feed. Since 1995/96, there has been a 15.3 percent increase in the national poultry feed requirements, which by 2010, are predicted to rise by a further 21.6 percent (Figure 1). In 2000, the dairy industry accounted for 20.4 percent (representing 1.55 million tonnes) of the national feed production. Of those feeds manufactured, 47.2 percent were produced by the formal industry. The current dairy herd is estimated at 563 453 animals, and comprises 422 590 cows in milk, 140 863 dry cows, 240 876 heifers and 316 942 calves (Briedenhann, 1999). The combined herd produces an estimated 2 180 million litres of milk per annum. The ratio of dietary grain to oilcake requirements is approximately three to one (Briedenhann, 2000). 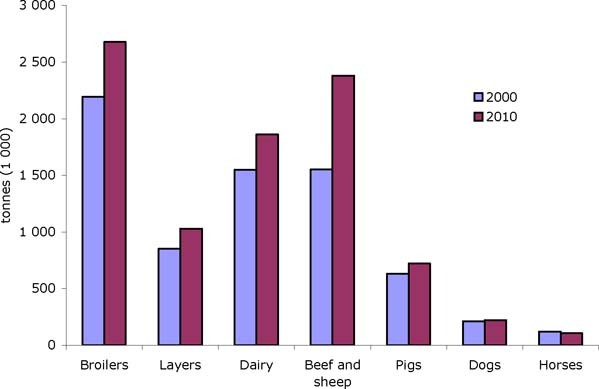 The industry's feed requirements have increased by 20.2 percent since 1995/96, and are expected to rise by a further 20.1 percent to 1.86 million tonnes by 2010 (Figure 1). In addition to the extensive sheep and beef farming operations that are currently in operation in South Africa, the feedlot industry is well established, and comprises approximately 1.6 million sheep and 340 000 cattle (Briedenhann, 1999). The combined feed requirements for this sector are similar to the dairy industry (1.55 million tonnes per annum), and thus accounted for 20.4 percent of the national feed production in 2000 (Griessel, 2001). The ratio of dietary grain to oilcake requirements is approximately 12 to 1 (Briedenhann, 2000). Since 1995/96, the feed requirements have grown by 4.1 percent, and by 2010, are projected to increase by 53 percent (Figure 1). Currently, the swine industry slaughters 1.9 million pigs annually (Briedenhann, 1999). In 2000, the industry accounted for 8.3 percent (representing 631 231 tonnes) of the national feed production; the formal sector supplied 39.8 percent of this figure (Griessel, 2001). The ratio of grain to oilcake in the rations is approximately 4.5 to 1. Since 1995/96, the pig feed industry has grown by 5.2 percent, and is projected to grow by a further 14.4 percent by 2010 (Figure 1). In 2000, horses and dogs (pet food industry) accounted for a respective 1.6 percent (121 047 tonnes) and 2.7 percent (212 000 tonnes) of the annual national feed production; 50.4 percent of the pet feed, and 17.5 percent of the horse feed was supplied by the formal sector (Griessel, 2001). The ratio of grains to oilcake in the rations was 1.7 to 1 and 4 to 1 in the dog and horse feeds respectively. While Briedenhann (1999) predicted no growth in the horse feed industry, a 4 percent growth rate was predicted in the pet feed industry. Thus, by 2010, the volume of feed produced by the pet feed industry will have increased to 264 576 tonnes (Figure 1). In addition to the well established animal feed industries, there are a number of smaller specialised feeds that are produced. Of particular importance is the ostrich industry that consumes 129 654 tonnes of feed annually (Briedenhann, 1999). The growth in the formal ostrich feed manufacturing sector has been considerable with an increase in production from 21 640 tonnes in 1997/98 to 49 913 tonnes in 2000/01 (Griessel, 2001). The ratio of grain to oilcakes in the rations is approximately 3.8 to 1. The animal feed industry is unable to compete commercially with those industries that pay premium prices for raw materials (e.g. for human consumption). As a result, only those raw materials that remain after the premium price paying industries have satisfied their requirements, are available to the animal feed industry. While the nutritional value of over 541 materials have been described, only those commonly used in South Africa or those showing potential for use in aquafeed production, will be included in this study. A total of 131 306 tonnes of fishmeal was available in South Africa during 2000/01 (Table 2). Of this figure, 72 percent was produced in South Africa, 11.5 percent imported from Namibia, and the remaining 16.5 percent imported from other countries. There are currently nine fishmeal processing plants in operation throughout South Africa. Collectively, they produced 95 000 tonnes of fishmeal in 2000/01. Historical figures suggest that South African fishmeal production varies on a yearly basis. Thus, while 95 000 tonnes were produced in 2000/01, only 47 500 tonnes were produced during 1997/98 (Griessel, 2001). Much of the shortfall in South African fishmeal production is taken up by Namibian imports. The annual quantity of product that is imported from Namibia varies considerably. Recent figures suggest that imports ranged between 28 000 tonnes in 1996/97 to 15 000 tonnes in 2000/01 (Griessel, 2001). Additional fishmeal supplies are obtained by imports from other fishmeal producing countries (in particular South America) and from factory ships (most notably Russian and Icelandic vessels). A total of 1.15 million tonnes of oilcake was available to the animal feed industry during 2000/01 (Table 3). Of this figure, 514 020 tonnes were locally produced and the remaining 635 134 tonnes imported. Soya oilcake was the most commonly used oilcake during 2000/01 and accounted for 51.5 percent of the total oilcake consumption. Sunflower and cotton oilcakes accounted for 35.2 percent and 9.4 percent of the total oilcake consumption, respectively. The remaining 3.9 percent of the oilcakes used during this period were derived from groundnut, canola, lupin, copra, palm and linseed. The total sunflower oilcake available to the feed industry in 2000/01 was 405 144 tonnes (Table 3). Locally produced were 342 720 tonnes and the remaining 62 424 tonnes imported. South Africa is ideally suited to growing sunflowers, and has currently eight seed crushing facilities capable of producing 315 000 tonnes of oilcake a year (Briedenhann, 2001). Nevertheless, the national feed industry is currently capable of utilizing 540 000 tonnes of sunflower meal per annum (AFMA,1999); and thus, while there is the potential to increase the sunflower production within the country (De Beer, 2001), 15.4 percent of the oilcake available to the animal feed industry in 2000/01 were imported. Groundnut oilcake is not of major importance for the animal feed industry. Despite an annual crop of 113 550 tonnes during 2000/01, only 4 173 tonnes of oilcake were produced. Neither groundnut nor groundnut oilcake were imported during this period (South African Grain Information Service, 2001). South Africa is a net importer of soya products. While local production of soybeans has increased in recent years - culminating in a record harvest of 200 000 tonnes in 1998 - production consistently fails to meet the national demand. Indeed, Birch (1999) concluded that production could more than double before the local requirements for either oilcake or full-fat meals are met; 88.7 percent of the oilcake produced in South Africa during 2000/01 were full-fat oilcake (Griessel, 2001). The remaining 11.3 percent of production were oil extracted soya cake. While 18 full-fat soybean processing plants with an annual processing capacity of 197 000 tonnes are in operation in South Africa, only one crushing plant is currently in operation. The absence of a significant soya oil industry is the result of a limited local market and the presence of cost effective imports available from South America (Briedenhann, 2001). Thus, despite the potential to increase local soybean production, South Africa remains a net importer of soya products, and in 2000/01 it imported 80.5 percent of its oilcake requirements. Annual cotton oilseed meal production in South Africa is inconsistent. While 48 370 tonnes were produced during the 1997/98 season, only 20 269 tonnes were available during 2000/01 (Griessel, 2001). The reduction of production is because of an overall reduction in the area planted (126 000 ha in 1985 to 73 000 ha in 1999; Briedenhann, 2001) and a reduction in the processing capacity. Currently, there is only one solvent extracting cotton seed crusher in operation in the country. The annual processing capacity of this plant is 20 160 tonnes. This figure is significantly lower than the national requirement. As a result, South Africa is a net importer of cottonseed oilcakes, and imported 81 percent of the 108 576 tonnes available in 2000/01. Imports were derived primarily form Nigeria and Argentina. A total of 14 602 tonnes of locally produced canola oilcake was available on the market in 2000/01 (Table 3). While canola production is still relatively small (25 000 ha planted in 1999/2000; Crop Estimates Committee, 2000), the area under cultivation is expanding rapidly. Total annual production of canola is approximately 28 000 tonnes. Thirty-six percent of the production is used as unprocessed full-fat canola, and the remainder marketed as either expeller extracted canola meal or solvent extracted canola meal (Brand, 2001). Currently, canola is not imported into South Africa (South African Grain Information Service, 2001). The local lupin production in 2000/01 was 17 360 tonnes (Table 3). The crop comprises a number of species including the sweet yellow (Lupinus luteus), broad leaf (Lupinus albus) and the narrow leaf (Lupinus angustifolius) (Brand and Brundyn, 2001). The majority of the crop is planted in the Western Cape (approx. 20 000 ha) with smaller amounts in the Free State (approx. 1 000 ha). Production in Kwa-Zulu Natal is expected to rise to 6 000 tonnes in the near future. At present, lupins are not imported into South Africa, and thus the local production satisfies local demand. The combined South African white and yellow maize production in 2000/01 was over 10.5 million tonnes (Table 4). South Africa is a net exporter of maize, and taking into account the potential for growth in production, may be expected to remain so until after the year 2020 (Briedenhann, 1999). As a signatory to the World Trade Organization (WTO), South Africa has to comply with international tariff regulations. Since 1997, the Department of Trade and Industry (DTI) has developed, together with specific agricultural industries, growth and development strategies that include tariff plans. It is envisaged that in the future all foodstuffs will become tariff free. However, at present, individual commodities are subject to different tariff rates. For example while the import tariffs on sunflower seeds are currently 9.4 percent, the tariff for soybeans is 10 percent. South Africa is not a member of COMESA (Common Market for Eastern and Southern Africa), and therefore plays no part in the tariff reduction strategies that this institution is encouraging. Aquaculture feed production in South Africa is a nascent industry producing approximately 2 918 tonnes (0.06 percent of national feed production) of feed in 2001. Nevertheless, despite its small size, growth in the sector has been significant with an increase in feed production of 181 percent between 1997/98 and 2000/01 (Griessel, 2001). Aquaculture production statistics suggest that 4 038 tonnes of produce was marketed in 2000 (Table 5). While a number of those species under production does not require formulated feeds (mussels, oysters, etc. ), a number requires significant quantities of formulated feeds. The quantity of aquafeed produced in 2001 is presented in Figure 2. The majority (78.5 percent) of the feed manufactured in 2001 was produced for the trout industry. 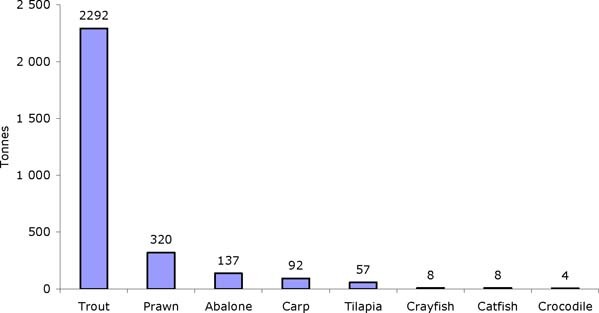 The prawn, abalone and carp industries accounted for 10.9, 4.7 and 3.2 percent of the feed production, respectively. The remaining 2.7 percent of the feed production was produced for the tilapia, crayfish, catfish and crocodile industries. These species and their feed requirements are discussed below. Trout farming is the largest component of the aquaculture industry in South Africa, and in 2000 represented 45.3 percent of the country's total aquatic production (Brink, 2001). The first trout ova were imported in 1896, and the first dry pelleted feeds produced in 1956 (Hecht and Britz, 1990). Trout production is typified by raceway, pond and cage culture. The industry is in a period of growth with 1988 production figures reported at 739 tonnes (Hecht and Britz, 1990), this figure increased to 1 650 tonnes in 1998 and 1 830 tonnes in 2000 (Brink, 2001). Feed production in 2001 was estimated at 2 292 tonnes, with the market dominated by two manufacturers both producing in excess of 1 000 tonnes per annum. A number of smaller operators is currently in operation, producing between 20 and 50 tonnes per annum. Dietary formulations are varied, with some companies offering a range of extruded pellet diets including specialised fry, starter and grower diets. Cleary, while the protein component of the formulations varies, they may contain mixtures of local fishmeal, imported LT-Fishmeal, soya and sunflower oilcakes (Annex 2 and Table 6). The carbohydrate sources incorporated into the formulations are either locally available maize or wheat products. Either locally available fish or rendered poultry oils supply the lipid component. Local and imported vitamin and mineral mixes are used in the formulation. With the exception of the imported sunflower oilcake and fish oil - for which supply was described as adequate - the supply of all the dietary components was described as excellent. Prices for the products vary, however they are generally within the range of US$0.42 - 0.61/kg. 3.1.2 Tilapia - Oreochromis spp. Tilapia (Oreochromis spp.) production in South Africa has increased from 70 tonnes per annum in 1998 to 175 tonnes in 2000 (Brink, 2001). Culture techniques are varied, and include high density intensive cage and raceway culture - in which the entire nutritional requirements of the animals must be met using formulated feeds - to extensive pond and dam culture, in which formulated feeds are either absent or used as supplements to the naturally occurring feed stuffs. Despite commercial interest in feed development and manufacturing during the late 1980s and early 1990s, there are currently only two companies producing dedicated tilapia feeds in South Africa. Production figures suggest that approximately 57 tonnes of feed were produced in 2001. The major producer has been in operation since 1998, and produces two types of extruded pelleted feeds. The first formulation is a low protein high energy diet (25 percent protein, 12.18 MJ/kg, Table 6) designed as a supplemental feed for use in semi-extensive and extensive pond and dam culture systems. The second formulation is a higher protein ration (34 percent protein, 12.25MJ/kg), and designed for use in intensive culture systems in which there is no supplemental feeding. Current formulations contain imported LT-fishmeal and soya oilcake as the protein sources as well as local maize and fish oil as the respective carbohydrate and lipid sources. An additional vitamin and mineral premix of both local and imported origin is added to the formulations. The availability of all the dietary ingredients was described as excellent. The exception being the availability of the South African fish oil which was described as adequate. The current retail prices for tilapia formulations vary between US$0.29 - 0.36/kg. Carp production in South Africa is split between the production of carp as a food fish and koi carp for the ornamental fish trade. Production statistics suggest that as an industry, the production in the koi sector is increasing at a faster rate than that of the food fish sector. Indeed, between 1998 and 2000 there has been a 192 percent increase in the production of koi carp as opposed to a mere 22 percent increase in the production of other carps. Semi-intensive pond culture is currently the preferred farming technique. There are currently three feed manufacturers producing carp diets. The combined production for 2001 was 92 tonnes. The protein component of the dietary formulations is based on local and imported fishmeals (Annex 2). One formulation contains an imported soy oilcake component. Carbohydrates are supplied by locally available maize. Locally available fish oil is added to those diets that have a supplementary lipid fraction. Imported vitamin and mineral premixes are added to the formulations. The availability of all the dietary components was described as excellent, the exception being the fish oil for which availability was described as poor. The current retail price for carp diets is approximately US$0.76/kg. The African sharptooth catfish is grown in intensive pond culture systems. The first ten tonnes of commercially grown catfish were produced in 1987. By 1990, production had increased to 1 500 tonnes, but fell back to some 1 150 tonnes in 1991, and collapsed in 1992 to 150 tonnes. By 1996, less than 15 tonnes were being produced. Production is now slowly increasing, and in 2000 a total of 65 tonnes were produced. Initially catfish feeds were produced by producers, feed manufacturers and agricultural cooperatives alike (Hecht and Britz, 1990). However, currently there is only one commercial catfish feed producer in operation. It has been in operation since 1998, and produces between 5 - 8 tonnes of feed a year. The product is an extruded pellet that comprises 32 percent protein and 4.1 percent lipid (Table 6). The protein component of the diet comprises a locally available LT-fishmeal and an imported soy oilcake (Annex 2). The carbohydrate and lipid fractions are supplied by locally available maize and fish oil, respectively. An imported vitamin and mineral premix is included in the formulation. With the exception of the adequate availability of LT-fishmeal and fish oil, the availability of all the dietary components was reported as excellent. The current retail price for the feed is US$0.35/kg. It should be noted that there is a discrepancy between the production figures for this species (65 tonnes in 2000), and the associated feed that is manufactured (5 - 8 tonnes in 2000) (Table 5). Resolution of this discrepancy probably lies in the manufacture of farm-made feeds by the producers. Shrimp production in South Africa is in its infancy with only two farms currently in operation in Northern Kwa-Zulu Natal. The operations are carried out in semi-intensive brackish water pond culture systems. Initially, Penaeus monodon was the species under cultivation, however, species-specific problems associated with its culture have curtailed production, which has now switched to the slower growing Penaeus indicus. Initially, two crops were produced each year, however, in recent years this has been reduced to one. Production figures reveal that 120 tonnes of prawns were produced during 2001 (Table 5). Feeds have been in production for the past seven years, and are currently "in-house" operations with the farms producing sufficient quantities to satisfy their requirements. In 2001, 320 tonnes of feed were produced at a cost of US$0.50 - 0.60/kg. The protein component of the feed is supplied by imported fishmeal, soya oilcake and locally available brewer's yeast (Annex 2). The carbohydrate fraction comprises wheat (both local and imported from Botswana) and wheat gluten (local production). The lipid fraction is supplied by locally produced fish oil and soya lecithin. The Australian crayfish or "Marron" was introduced to South Africa as an aquaculture species in 1984 (Hecht and Britz, 1990), and despite initial technical difficulties, has developed into a small but viable industry. Eight tonnes of marron were produced in 2000 (Table 5). Marron is produced in intensive pond culture systems. As detritivores, their growth rates are inherently slow - a problem exacerbated by a short growing season in those areas in which they are cultivated. One company is currently producing a formulated feed that aims to improve the growth rates, such that a crop can be harvested after one growing season. The manufactured feed is an extruded pellet (38.7 percent protein, 4.6 percent lipid; Table 6). The protein component of the formulation is supplied by an imported LT-fishmeal and soy oilcake (Annex 2). The carbohydrate source is provided by locally available maize. While lipid is not incorporated into the formulation, an imported vitamin and mineral mix is required. The availability of the dietary components has been reported as excellent. The product was first marketed in 1998 at an approximate level of 3 - 4 tonnes per year. Production figures for 2001 reveal an increase in production to 8 tonnes. The current retail price for the product is US$0.60/kg. Abalone farming in South Africa is a relatively new industry. It started in the late 1980s, and by 1998 comprised nine farms (Cook, 1998). While additional capacity has been built since 1998, the inherent slow growth of the animals, and subsequent long production cycles ensure that the current production volumes remain small (180 tonnes in 2000; Table 5), although there are indications that some 500 tonnes will have been produced by the end of 2001. Typically, abalone farming in South Africa is a land-based operation using highly intensive pump-ashore technology. A specialised artificial feed has been developed by Rhodes University to satisfy both, the nutritional requirements of animals and the specific farming conditions experienced in South Africa. The feed is under continual development, and thus improvements to the formulations are made on a regular basis. Currently, the feed is formulated to contain 34 percent protein and 5 percent lipid (Table 6). The feed (extruded flat pellets) has been produced locally by Sea Plant Products Ltd in Hermanus since 1997. In 2000, 137 tonnes of feed were manufactured. The retail price of the feed is currently US$1.35/kg. A locally produced soya product and an imported LT-fishmeal are used to supply the protein component of the feed (Annex 2). Locally produced starch (information pertaining to the carbohydrate component of the diet is proprietary information, Sea Plant Products Ltd Hermanus) and fish oil are used as the carbohydrate and lipid sources, respectively. A locally produced vitamin and mineral mix is used as an additive. The availability of dietary ingredients was reported as excellent, the exception being the starch and vitamin/mineral components for which current availability was described as adequate. Traditionally, crocodile feed has been supplied as chicken carcasses, abattoir waste and other offal. However, in response to concerns about the availability of these feed sources, and the adverse environmental effects that they may have on the water quality in culture systems, one feed manufacturing company has developed an extruded pellet feed. Production of the feed started in 1998, and remains stable at 3 - 4 tonnes a year. The pellet is an extruded product (44 percent protein, 15 percent lipid; Table 6), and based on an imported fishmeal, local maize, fish oil and an imported vitamin and mineral mix (Annex 2). The availability of the dietary components was described as excellent - the exceptions being the fishmeal and fish oil for which the availability was described as adequate. The retail price of the feed is currently US$0.61/kg. The information compiled in this report was obtained by surveying the aquaculture feed manufacturers operating in South Africa. While visits were made to some of the manufacturers, others were interviewed telephonically or responded to a survey questionnaire. Farmers and institutions involved in the aquaculture industry were consulted. The animal feed manufacturers association (AFMA) was contacted, and material from their recent symposia (1999, 2001) is cited. AFMA. 1999. Survey on the maximum potential of sunflower oilcake usage in South African animal feeds. Animal Feed Manufactures Association, South Africa. Unpublished report. Birch, E.B. 1999. Soybean production prospects. Maize. National Maize Producers' Organisation, Potchefstroom, South Africa, October 1999, pp. 77 - 79. Brand, T.S. 2001. Canola in pig nutrition: A South African perspective. In: Proceedings of the Animal Feed Manufacturers Association. Pretoria, 12 October 2001, pp. 37 - 56. Brand, T.S. & Brundyn, L. 2001. Die fisiese en chemise samestelling, energie-inhoud (WMEn) vir hoenders, sowel as aminosuubeskikbaarheid van lupiene, fababone en narbonbone. AFMA Matrix, South Africa. September 2001, pp.10 - 15. Briedenhann, E. 1999. Raw material requirements and availability for South Africa 2000 to 2010. In: Proceedings of the Animal Feed Manufacturers Association. University of Pretoria, 15 October 1999, (unpublished). Briedenhann, E. 2001. Raw material update for the South African feed industry. In: Proceedings of a congress presented by the Animal Feed Manufacturers Association, Sun City, South Africa, 21 - 23 February 2001, (unpublished). Brink, D. 2001. Aquaculture production in South Africa. In: Proceedings of the Animal Feed Manufacturers Association. Pretoria, 12 October 2001, pp. 57 - 65. Cook, P. 1998. The current status of abalone farming in South Africa. Journal of Shellfish Res., 17: 601 - 602. Griessel, M. 2001. Chairman's report to the Animal Feed Manufacturers Association. AFMA annual general meeting, Knysna, 31 October 2001.Pretoria. Hecht, T. & Britz, P.J. 1990. Aquaculture in South Africa. History, status and prospects. The Aquaculture Association of South Africa, NMB Printers, South Africa. pp58.